We only have a select few foster homes for senior dogs. As soon as one of those foster homes is available, we specifically look for a senior dog in a shelter. 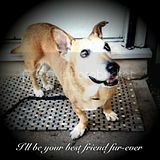 We are always searching for additional senior dog foster homes. All of our dogs are chosen based on their overall temperament and behavior and our process for accepting senior dogs is no different. It seems the larger the dog the harder it is to find them a home and we like to focus on the larger dogs when at all possible. People shy away from the larger dogs, they’re concerned with health issue and many are simply looking for a dog that has a longer lifespan than a senior. I also think one of the biggest misconceptions about senior dogs is that they’re still not able to do most things a younger dog can do. Many of the older dogs we rescue still enjoy taking walks or going on hikes, playing with other dogs, playing fetch or anything most other dogs enjoy doing. illnesses and all receive a full dental cleaning. Adopters of our senior dogs have the option to accept or decline our limited veterinary assistance. We offer free lifetime annual exams and vaccinations and free lifetime heartworm preventative. Give mature dogs a better opportunity to find permanent homes. Educate the public on the positive side of adopting mature well mannered dogs. Provide a more practical dog-adoption option.